Many of the golf courses around Lake Tahoe are 6,000+ feet above sea level. Because of the high elevation you will get an extra 6 to 10 percent more distance than at sea level. A good rule of thumb is to hit one club less than you would at home. When playing on golf courses that are close to the lake, prevailing winds can come in and make for some difficult club selection on some holes. The playing season varies from course to course. All of Tahoe’s golf courses will be happy to send you a brochure and a fact sheet or answer phone inquiries about the course, rates, weather and special events. Call (530) 587-9443 for the Pro Shop or Operations. Call (530) 587-9440 for reservations. 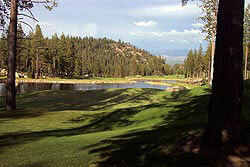 18-hole Championship course located in Tahoe Donner. Jack Nicholas, Craig Stadler and Tom Watson have all tested the tight fairways and towering pines. 10685 Northwoods Blvd. Truckee, Calif. The course sits on 250 acres of secluded rolling hills, majestic pines, and wildflowers. Without a single house to spoil your view, playing Coyote Moon Golf Course offers an experience seldom found in golf today. “This golf course demands that you be able to shape your tee shots in both directions in order to really score here, which to me brings out the best elements of golf. You will also notice that if you miss the greens, there are so many varieties of options left to you to get close. You can pitch and run, hit flop shots, and just be very creative in your play around the greens. You will use all of your game here at Coyote Moon, ” explained Director of Golf Paul Martin.